For all the readers following this blog (hopefully lots of you! ), Part 3 has been delayed a bit by how busy Bonnie and I have been since leaving Berlin -- spending three days with friends in Rosbach, then moving on to visit an iStock photographer in a little town near Dortmund. We've been doing what you'd expect -- photography. Wednesday, for example, we toured an old coal mine industrial complex, Zollvererin, that is now a tourist attraction -- and I (believe it or not) modeled for photos suggestive of dying industry. Part 3, now partly written, will focus on a concentration camp that doesn't get as much press as the big names like Auschwitz and Dachau and Bergen-Belsen. You just can't escape the horrors that emanated from Germany seven decades ago, as bits of that history turn up everywhere -- even when you are not seeking them. Late this afternoon, for example, returning to our host Sylvia's apartment building in suburban Frondenberg, we heard music from a small park just below. It was a dedication ceremony for an improved memorial to the few Holocaust victims of the community. There were few Jewish people in this part of town in the Nazi era, but those who were here and perished are remembered. Soon to come -- a photo of the dedication ceremony, and then Part 3 with the truly terrible story of the place near Berlin where killing techniques were designed and practiced, and future Nazi concentration camp commandants were trained. David and Bonnie join hands with tourists at East Side Gallery. We visited Berlin's East Side Gallery Wednesday afternoon, and found first-hand just how topsy-turvy our world has turned in a mere 20 years. The gallery consists of murals painted on a nearly mile-long surviving stretch of the Berlin Wall that cut through the heart of the city in a division of East and West -- nation and world -- from 1961 until its astonishing fall in November 1989 that led within months to Germany's reunification. This section of the Wall blocked access to the eastern bank of the River Spree, a killing zone for anyone managing to cross the concrete barrier embodying the Cold War era's Iron Curtain. Now there are gaps, one of which houses a souvenir house where tourists can pay to have an East Berlin stamp added to their passports. Another leads to a beach-style restaurant and beer garden. We strolled slowly along the sidewalk on what once was deadly territory for those daring to attempt escape from East Berlin, and took in the more than 100 works of outdoor art. Then we stopped to watch a group of tourists posing for group pictures. They joined hands in a chain, with the wall art as a backdrop. 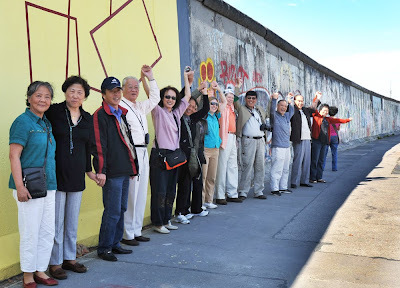 I offered to take the camera from one man so he could pose with the rest of his group, then Bonnie and I were invited to join in the human chain of hands, and our picture was taken in the group. We raised our linked hands together, strangers smiling together. "Where are you all from?" I asked a seeming 40-something woman in the group, speaking slowly so she might understand my English. "Welcome to China," she replied. So there we were, global East meeting West at what once stood as the border of ideology -- communist and so-called free world. You wonder how to say, in German or Chinese: "We´ve come a long way, baby!" On the Road Again: Sprechen zie English? No matter where we go, Bonnie and I seem to find adventures purely by chance -- and that seems to be the case for our latest road trip, this time in Germany. Barely recovered from jet lag after a Thursday/Friday overnight flight to Berlin, we've been to a massive anti-nuclear demonstration Saturday afternoon at the base of the Brandenburg Gate, followed by the final night of an international fireworks competition at the historic Olympic Stadium where the black American track star Jesse Owens won gold in the face of Hitler's growing Nazi might. A crowd clearly numbering in the tens of thousands, including a parade of theme-decorated tractors and trucks, stretched as far as the eye could see westward from the old border crossing of the Cold War era's divided Berlin. Opponents of nuclear energy included young and old, in a turnout showing free expression is robust in the German capital. The demonstration came three weeks before national elections, and though the Green party is very much a minority, the activists were voicing strong opposition to incumbent Chancellor Angela Merkel who is viewed as pro-nuclear and a threat to delay or block Germany's planned closure of atomic energy plants by 2020. Many of the tractors and demonstrators came from the area of Gorleben in eastern Germany, the site of a nuclear waste dump. Among the many colorful posters and banners waved and displayed, my favorite was a simple yellow sign declaring: Gorleben ist überall. The translation, provided by our German friends and hosts Beate and Ellen: "Gorleben is everywhere." Nearby, two seeming teenagers stood and waved large signs atop a giant trojan horse clearly symbolic of the dangers foreseen from atomic plants and nuclear waste. Our friends told us how once a year, a train hauling nuclear travels across Germany in a trip slowed by protesters who sit on the tracks until carried away by the police. Peaceful protest, too, is alive and well here. Media accounts put the number of protesters in the range of 50,000, and the tractors at about 400 -- enough to produce a bit of traffic chaos. But we got there by the Underground subway -- our first journey using the local mass transit. I stopped at a tourist information shop near the Brandenburg gate and asked if there was a map of the transit system in English. "Why would you want one?" asked a young man working at the counter. "All the stops and signs are in German." But he offered a subway map with larger letters, making the German easier to read for my 2.5-magnification-assisted eyes. After returning to our friends' apartment for dinner, we ventured out to Olympic Stadium about a mile away and stood in the occasional light drizzle and breezy chill to watch the aerial part of the fireworks show (and the glow and flashes from ground displays inside). Some of the bursts were unlike any we've seen in Baltimore. It would have been nice if international fireworks competitions had scouts from the States to check out the latest in big bang shows. Check back later for more of Bonnie's photos, and our continuing venture into another country where, frankly, my lack of foreign language skills makes every day a little unpredictable.